Dr. Kreuz is your Calgary Invisalign Preferred Provider! Consider Invisalign treatment to get the beautiful straight teeth you've always wanted — without braces. Invisalign consist of a series of clear plastic, removable aligners that move your teeth in small increments. Invisalign is made with advance 3D computer imaging technology to create your treatment. Not only are the aligners invisible, they are also removable. This enables you to have easy access to brush and floss, as well the freedom to maintain your usual diet. There is also minimal discomfort compared to traditional braces, as the aligners don’t use pokey wires or brackets. To achieve the best possible results, you’ll need to wear your aligners for at least 22 hours per day, removing them only to eat, drink, brush, and floss. You’ll also need to visit Dr. Kreuz every three to six weeks so Dr. Kreuz can check your progress and give you additional aligners. During your consultation, Dr. Kreuz will discuss with you the estimated length of treatment time to complete your orthodontic goals. 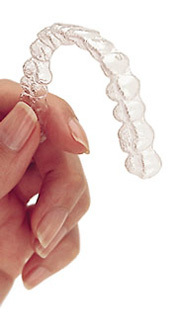 Invisalign aligners can treat many concerns. Contact our Calgary dental office to schedule a consultation with Dr. Kreuz to see how Invisalign can benefit you!